While Elon Musk is busy inventing cars and flame-throwers, he’s just as busy planning on homicidal trips to Mars, and, evidently, stealing farting unicorns. It was last year when Musk tweeted (since deleted) how much he loved this “Farting Unicorn” mug, the Tesla CEO calling it “maybe my favorite mug ever.” Take note of the unicorn, the farts, and the car at the base. The mug comes from a Colorado potter named Tom Edwards. He created the farting unicorn mug and debuted it on his website in 2010 as a way to poke fun at people who don’t really understand how electric cars work. “Since half of our electricity comes from coal, the electric car isn’t quite as magical as it seems. This mug is selling really well in my online store, and I figure anything with rainbows and unicorns has to be a hit!” he said. A fan of Musk, Edwards was thrilled when he tweeted out a pic of the mug and his sales jumped. 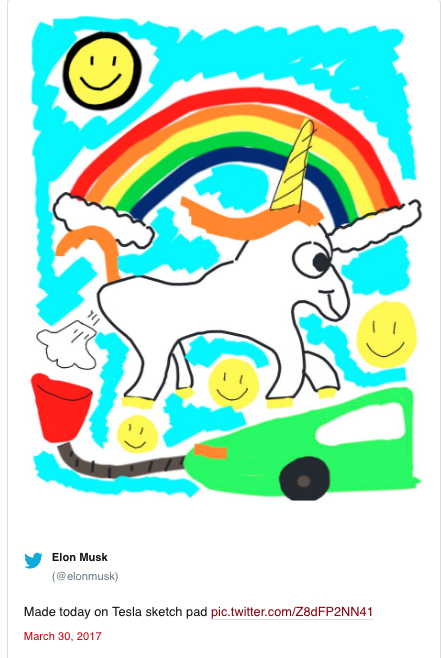 But then, a month later, his farting unicorn cropped up on Musk’s Twitter, promoting Tesla’s new “sketch pad” feature. Here’s a snapshot of Musk’s — since deleted — tweet. Notice the image is the exact same as the mug, only with slightly different shapes and more vibrant colors. 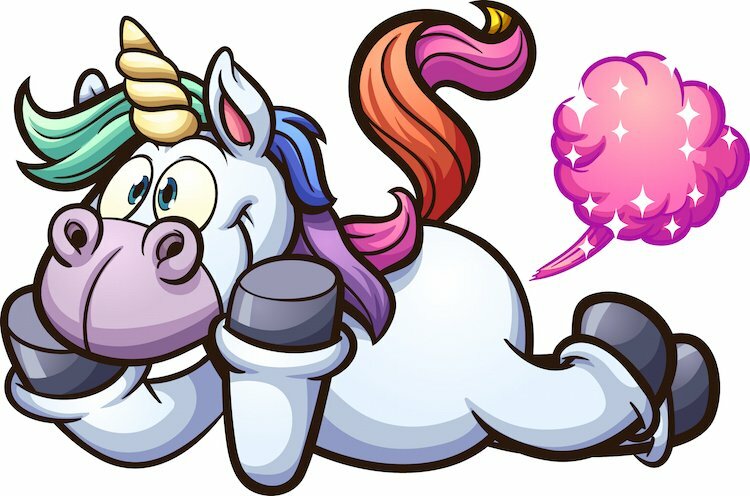 Even then, the 61-year-old artist was going to let it all slide … until he learned Musk’s company was using the farting unicorn as an image in Tesla’s operating system as a small icon AND it was used in a Christmas card. According to The Guardian, Edwards hasn’t sued yet, but has sent Musk a letter asking for some type of agreement. It’s clear he wants reasonable compensation. Musk, however, seems uninterested in compensating or crediting the artist. Instead, he tweeted at Edwards’ daughter this week that it would be “lame” to sue and that the potter should be grateful for the “attention”. Tesla has declined to comment so far. Again, all previous tweets Musk made on the matter have all now disappeared as quickly as a unicorn fart in the wind. Considering the art appears to be a digital re-sketch of Edwards’ original, using slightly different shapes and colors, it’s hard to tell whether there is a lucrative settlement on the artist’s horizon or not. However, his lawyers claim it’s “copyright 101.” In other words, a slam-dunk case. Edwards also noted he still wants to be a fan of Musk, but he’s not above copyright law. Sir, you are a more noble man than most. We hope you keep creating more renditions of your farting unicorn, and that people keep buying them. Because if we can’t get along with farting unicorns, with what can we?